If you like tan double buckle dress shoes that have real modern flavor and style, try Giorgio Brutini shoes. 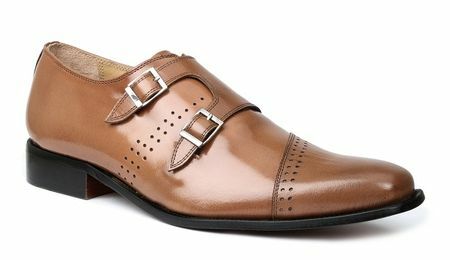 These fancy looking double buckle dress shoes are made of rich tan leather with a perforation design cap toe style. All ready to bring the party to the party. Double monk strap style shoes are one of the most popular shoe styles for men who know and appreciate dressing with style. These shoes are perfect for wearing with slim fit style suits and modern fit style suits as well showcasing what you're made of.